The Episode starts with Ramesh, Gomti and Narendra watching news about terrorists attacking the people. Ramesh says Police shall kill terrorists. Narendra says that is not the solution. Vedant and Purva come down and he tells that they will have food outside. Gomti says everyone is dying and they want to have food. Vedant gets Dr. Rashmi’s call about the bomb blast patients. Vedant tells purva that he has to go to hospital. Purva says she understands. Gomti taunts her. Vedant comes to hospital and assigns Dr. Rashmi and Pankhudi to handle the patients with small injuries and tells that he will handle serious patients along with Dr. Sharma. Pankhudi says she doesn’t know how to note down the details of so many patients. Vedant says we have to take a decision according to the situation. Pankhudi gets shocked seeing an injured pregnant woman and comes to Vedant. She tells that the woman is badly injured, but baby is saved. Dr. Rashmi checks the file and helps Vedant. Pankhudi is still tensed. Dadi tells Purva that it is not easy to be Doctor’s wife as his duty is more beyond that his family. Purva says she never wanted a God and wanted a small family. She tells about her idea of a family and says sorry. Dadi says life is a truth, which is sometimes more beautiful than dreams, and sometimes very much ordinary. Purva says dreams are not in our hands, but we can change the truth. Pankhudi and Dr. Vedant operate on a pregnant lady. Dr. Rashmi tells that the operation ran for 4 hours. Patient’s husband thanks him and says I am poor, but will repay your fees. Vedant asks him to take care of his wife and baby, and says this will be my fees. Dr. Rashmi asks him to rest for a while. Minister comes to the hospital to see the patients and asks his man about Vedant. Media questions him. Peon comes to Vedant and sees him resting. Vedant asks what happened? Peon asks him to sign on the papers. Pankhudi comes to vedant and gives him tea. She says she is feeling bad as she couldn’t handle her responsibility. Vedant says she shall learn now. Pankhudi says she is an intern and his sister in law too. Vedant says you are a doctor here and tells that she will see many people critical in hospital daily, and have to be courageous. Minister/MP’s man comes to Vedant and says Minister is having fever. Vedant says I am a gynaec. Minister’s man says MP Saheb has anger fever and asks him to come else he will get angry. Vedant agrees. MP meets the patients and asks them to be courageous. He asks his man if Doctor came. Vedant is coming there. His man sees Vedant coming and says he is coming. Dr. Rashmi comes to Vedant and says Saira’s condition is deteriorating. Vedant goes to attend Saira without greeting him. MP gets angry and asks his man to call Ramesh. Vedant comes home and sits. He asks Manjula to give him food as he is hungry since yesterday. Ramesh tells him that MP called and threatened him, as Vedant insulted him and didn’t shake hands with him. Vedant asks why did he call you? Ramesh says he was his college friend. Narendra says MP Chokas is very dangerous. Vedant says I didn’t insult him intentionally and went to attend a serious patient. He says I will apologize to him. Ramesh says he asked for 50 lakhs rs else the hospital will be closed. Dadi asks why? Vedant says I will not give the bribe and will not do wrong. Dadi asks if there is any other way. Narendra says Chokas is very bad and killed a man infront of thousands of people. Gomti asks Ramesh to make him understand as he is your friend. Ramesh says gunda understands only money language and says we have just hospital and house. He says we will mortgage hospital at Dr. Agarwal. Vedant says he will not give partnership to Dr. Agarwal and he wants the hospital to run on Dadaji’s siddhant. Purva asks Ramesh to give some time to Vedant and says he will handle everything. Vedant says he will think and goes. Ramesh tells Purva that it is not easy to handle the MP. Sumiti asks if Vedant can save us from MP. Purva says Vedant will handle everything and says Vedant haina…Dadi looks surprised. Purva comes to room. Vedant thanks her for taking a stand for him and tells that he doesn’t know what to do. Purva tries to cheer him up and says you can do it. They smile. Purva says mazaak hai kya as electricity goes. They come out and find neighbors light on. Ramesh says it must be chokas doing. Everyone’s phone start ringing one by one, shocking them. Precap: Someone throws a parcel inside the house. Ramesh asks everyone to back off and says it might be a bomb inside. Vedant picks the parcel. 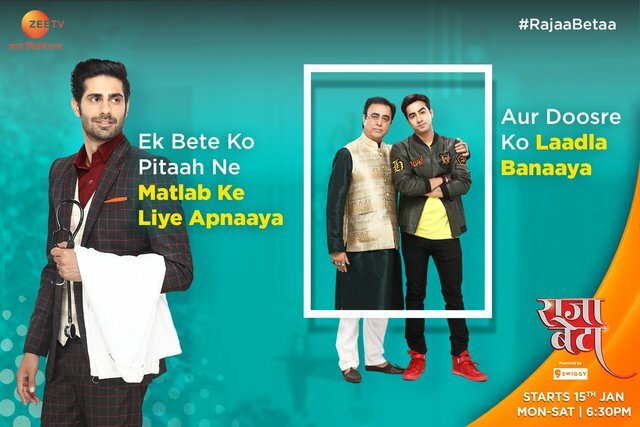 The post Raja Beta 11th March 2019 Written Episode Update: MP feels insulted and asks bribe from Vedant appeared first on Telly Updates.